Digital Scales – Strainsert Co. The primary advantage of digital displays over analogue displays is that they are more easily and quickly readable. This is true of most digital displays, in and out of the context of scales. In industrial contexts, for example, several seconds can be saved by an employee who can quickly look at a digital scale during an industrial process instead of an employee who has to decipher the readout on an analogue scale. The accumulation of these saved seconds can, on a long enough timeline, translate into increased productivity. 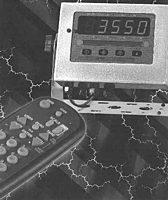 For this reason, industrial scales are often equipped with digital displays when possible. Digital readouts can sometimes be easier to read without mistake, which can, coupled with the time saved, lead to better productivity and reduced accidental misreading. Many different kinds of scales can be equipped with digital displays; a few examples include platform scales, floor scales, medical scales and bench scales. Digital scales display weight measurements digitally rather than in dial, analog, or balance beam form. This display is called liquid crystal display (LCD). LCDs block light through the reaction of liquid crystals to electric current. As a result, the area in which the light is blocked is darkened, and when electrical current is strategically applied, the darkened areas form numbers that represent the weight reading. Digital scales require no calculations like mechanical scales and are often portable and easy to use. The display on digital scales is achieved through the use of light-emitting diodes (LED). These semi-conductors produce light through their reaction to electrical current. When electrical current is supplied in a particular manner, the diodes illuminate in numerical shapes. Digital scales offer high precision by using complex systems, such as load cell technology that translates the weight of an object into electronic signals, which are conveyed to the user in digital form. They are also very accurate and reliable, with the ability to weigh objects for a wide range of applications. Digital Scales Digital scales are weight measurement tools that indicate measured weight on a digital display. They are distinct from analogue displays, which provide weight measurements on a turning dial, a balance beam or by other means.